Killed in a gunfight in the Bronx last Friday , Sergeant Tuozzolo (pictured above with his wife, Lisa) was a 19-year veteran of the New York Police Department and had spent the past decade assigned to the 43rd Precinct in the Bronx. Paul Tuozzolo was raised in Bayville, N.Y., a waterfront village that borders Long Island Sound, Sergeant Tuozzolo moved about six years ago to the larger town of Huntington, where he and his wife, Lisa, were raising their two sons, both of whom are under the age of five. On Saturday, his neighbors on Cutting Street, a quiet, tree-lined byway, remembered him as a good father and a decent man. Sgt. Paul Tuozzolo, left, was killed by a heavily armed gunman responding to a home invasion. Sgt. Emmanuel Kwo, right, was shot in the leg in the same incident. Condolences for Sergeant Tuozzolo, who was 41 and would have been eligible to retire next year, poured in from all corners after the shooting. He was mourned on Twitter by police departments in California, Massachusetts, Michigan, New Jersey and Pennsylvania. 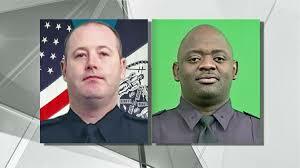 “To our extended Law Enforcement family of NYPD our condolences on theshooting death of 19 year veteran Sgt. Paul Tuozzolo-RIP,” the Anaheim, Calif., Police Department wrote. In New York, Mayor Bill de Blasio announced that flags at all city buildings would fly at half-staff from Saturday until Sergeant Tuozzolo’s burial, which had not yet been scheduled. At a vigil for Sergeant Tuozzolo, a pipe and drum band played and the speakers included Ed Mullins, president of the Sergeants Benevolent Association. On Saturday morning, Patrick J. Lynch, president of the Patrolmen’s Benevolent Association brought flowers to Sergeant Tuozzolo’s station house, which was draped in blue-and-black funeral bunting. Candles and blue balloons had been placed near a wall outside as a memorial.